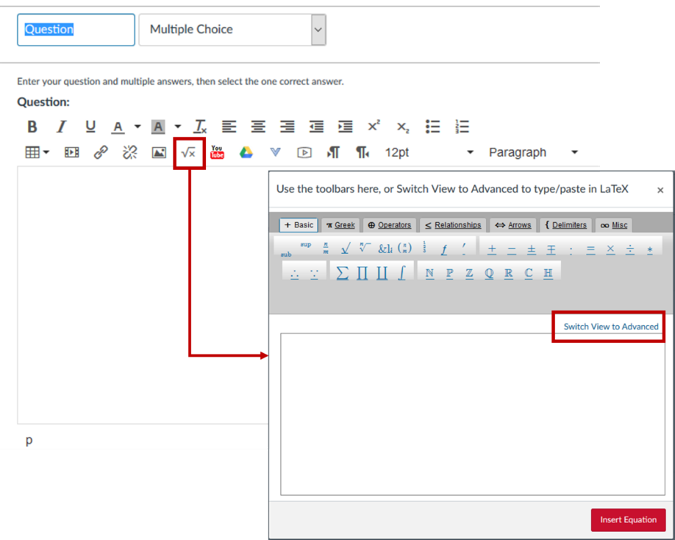 Making math equations accessible for learners by applying Universal Design principles is challenging, especially when we try to integrate them into a Learning Management System (LMS) such as Canvas. Although there are alternative tools offered by several software companies (such as Word and PowerPoint formula add-ons), these tools often do not work properly across platforms (from PC to MAC or, even, from one computer to another). In addition, complex questions with equations cannot be copied from such software and pasted correctly into Canvas assignments and/or quizzes. The quality of the screenshot could be poor thus reducing its readability. Screen readers cannot read text/equations saved as images. This prevents learners relying on such devices, access to the actual content. Screenshots are still images and therefore cannot be edited within the LMS (Canvas). The second commonly followed practice is to create the documents in Word, PowerPoint, or LaTeX and convert them to PDF and attach/upload these files to the appropriate place in the course. Although this practice makes the content more portable, it still does not address the accessibility concerns listed earlier. Moreover, due to protocols governing proprietary software, like Word and PowerPoint, screen readers cannot read equations once the document is exported/saved in PDF. In addition, the questions cannot be copied directly from MS Word and pasted into the LMS correctly. Disclaimer – These instructions were developed using Canvas on 11/01/17. Any subsequent updates made to Canvas could potentially affect the accuracy of these instructions. Listed below are instructions to make math equations accessible. It is assumed that you have LaTeX and Texmaker set up on your computer. I have a LaTeX file with equations. How can I transfer these equations from LaTeX file to Canvas? Let’s assume you want to create a midterm exam in Canvas. Let’s also assume that you already created a LaTeX file of this exam. Go to your LaTeX file and locate the equation(s) that you want to transfer to Canvas. Copy the equation from LaTeX and go to Canvas quiz area. Click on “Launch Math Editor” button on the toolbar to activate the math editor in Canvas. This action will produce a popup window. Click “Switch View to Advanced” link on the top right of the editable box. Click “Insert Equation” button to add your copied equation. Once it is inserted, it will appear as an editable equation in the question area. In the future, if you would like to edit this equation, click on the equation first and then click “Launch Math Editor” button on the toolbar to activate the math editor in Canvas. Let’s assume we want to create a midterm exam in Canvas. Let’s also assume that we already have this exam in Blackboard. Download MathType to your computer by following the instructions on the ISU website. MathType is free to download for ISU students and employees. The software works on PC (with Windows OS) and MAC. Unfortunately, there is not enough information regarding Linux OS. Once you download the software, restart your computer to make sure it is added to all Office programs that you currently have on your computer. Complete the following 4 steps. Step 1: Set Up MathType for Canvas. You need to modify your MathType settings to be able to work with Canvas. 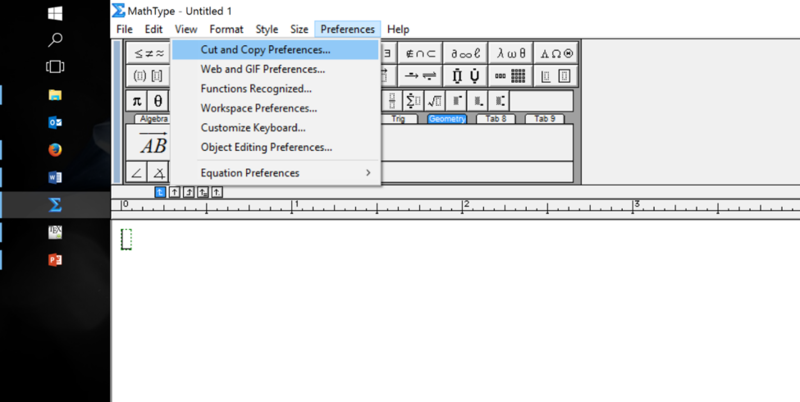 Open MathType on your computer and click the “Preferences” tab on the menu bar. Select “Cut and Copy Preferences” from the drop down menu. 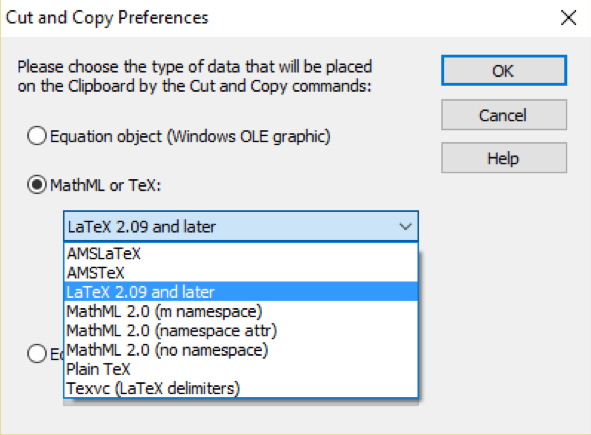 Click “MathML or TeX” radio button in the pop-up window and select “LaTeX 2.09 and later” from the drop down menu. 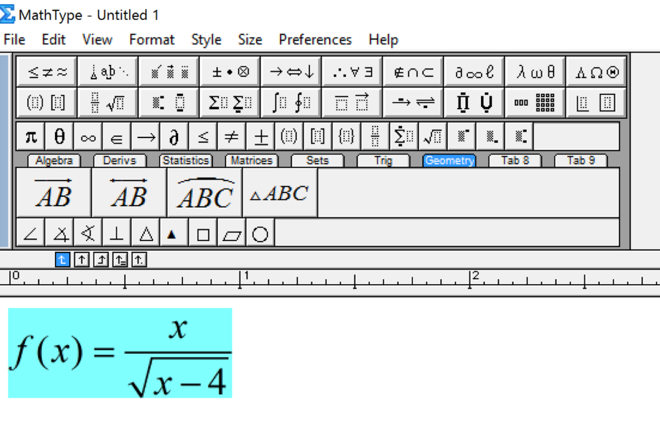 Now you are ready to type/paste your equations into MathType that will be copied to Canvas. Locate the equation(s) in Blackboard that you want to transfer to Canvas. Click “Launch Math Editor” button on the toolbar to activate the math editor in Blackboard. This action will produce a popup window. Select the whole equation and copy it. Step 3: Paste your equation into MathType. Paste the equation that you copied from Blackboard into to MathType. Step 4: Copy the equation from MathType and paste it into Canvas quiz. Copy the equation from MathType and go to Canvas quiz area. Click “Launch Math Editor” button on the toolbar to activate the math editor in Canvas. This action will produce a popup window. Locate and click “Switch View to Advanced”. Paste the equation copied from MathType into the Advanced View editing area. 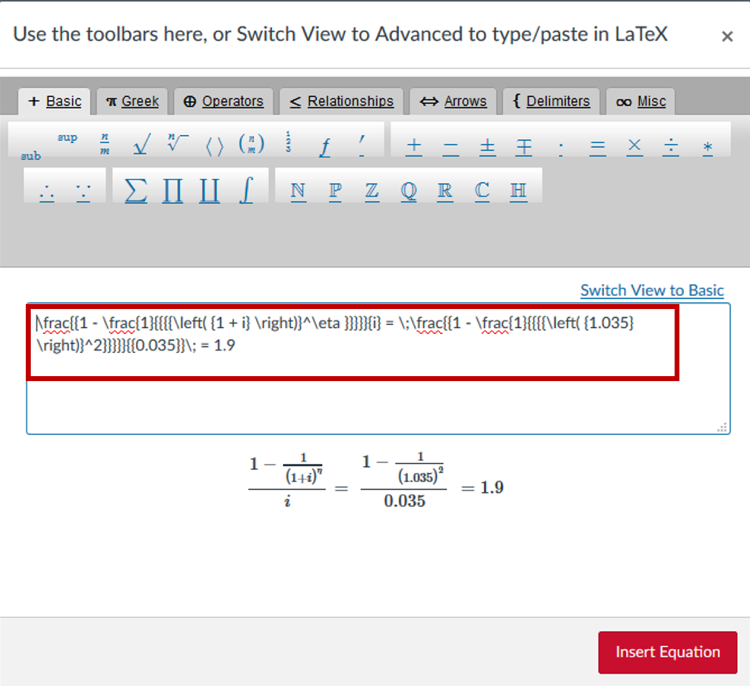 Click “Insert Equation” button at the bottom to enter your copied equation. 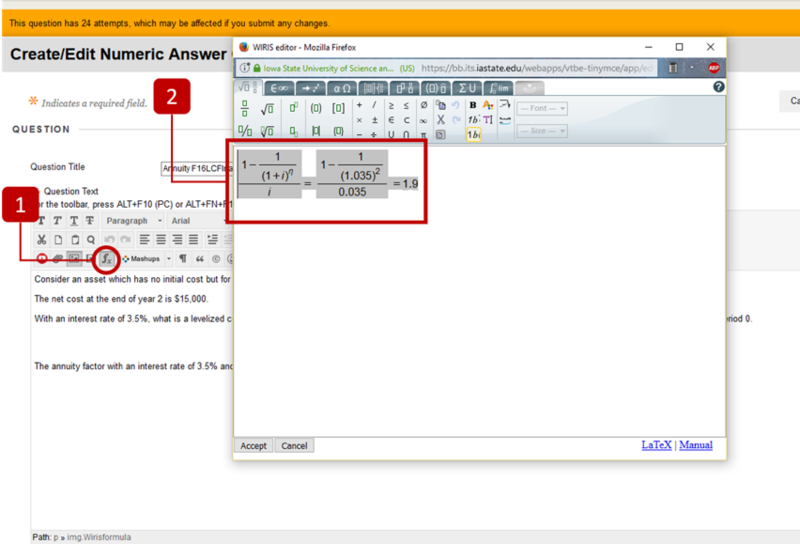 Once it is inserted, it will appear as an editable equation in the question area.